Radko Gudas has been set for a telephone hearing with the NHL’s Department of Player Safety to review a hit on Boston Bruins forward Austin Czarnik during a preseason game on Saturday. The hearing, set for Monday, comes a week after Gudas avoided supplemental discipline from the league for a boarding penalty he received after a hit on New York Rangers forward Jimmy Vesey. The NHL offered Gudas an in-person hearing for the Czarnik hit on Sunday, but the Philadelphia Flyers defenseman opted for a hearing over the phone. The NHL has the right to suspend Gudas more than five games, according to Sportnet’s Elliotte Friedman. Gudas, 26, plays a physical game and his style has come under scrutiny in the past. Given the proximity in time to the hit on Vesey, Gudas could be looking at a suspension to start the 2016-17 regular season. The hit on Czarnik won’t look good from the Department of Player Safety’s point of view. After Czarnik released the puck near his own team’s blue line, Gudas skates in on Czarnik and his shoulder makes direct contact with Czarnik’s head on what is an avoidable hit. Czarnik left the game and did not return. He suffered a concussion and will be out 7-10 days, according to a report from the New England Hockey Journal’s Kirk Luedeke. The 23-year-old rookie was expected to start the season on the Bruins’ third-line, but his NHL debut will be delayed because of the injury. After playing parts of three seasons with the Tampa Bay Lightning to start his NHL career, Gudas completed his first campaign with the Flyers in 2015-16. This offseason he signed a four-year, $13.4 million contract extension. Florida Panthers forward Jonathan Huberdeau will miss three to four months after cutting his leg with a skate during a preseason game on Saturday, the team announced. Huberdeau suffered the injury after an awkward play behind the net during the first period of a game against the New Jersey Devils. Huberdeau’s injury is a major blow to the Panthers as the team looks to build upon the success of its Atlantic Division title season in 2015-16. The 23-year-old forward registered career highs with 20 goals and 59 points in 76 games and was rewarded with a six-year, $35.4 million contract extension earlier this offseason. The Panthers will also start the regular season without forward Nick Bjugstad, who will miss the next three to four weeks with a broken hand injury he suffered during an exhibition game against the Dallas Stars on Tuesday. 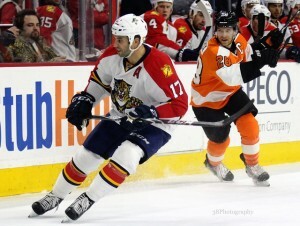 The Panthers named forward Derek MacKenzie the ninth captain in team history on Sunday. The team also named Aaron Ekblad and Jussi Jokinen alternate captains. MacKenzie, 35, served as an alternate captain for the team last season and will take over the captain duties from defenseman Willie Mitchell who appears set to retire. MacKenzie has spent the past two seasons with the Panthers and registered 13 points in 64 games during the 2015-16 regular season. After the announcement, Panthers president of hockey operations, Dale Tallon, spoke about the character and leadership qualities MacKenzie brings to the team. — The St. Louis Blues have recalled goaltender Jordan Binnington, according to Jeremy Rutherford of the St. Louis Post-Dispatch on Sunday. Jake Allen is expected to start the season between the pipes for the Blues but went down with a leg injury during a preseason game on Saturday. — The Carolina Hurricanes signed defenseman Jacob Nakladal to a one-year, $600,000 contract, according to Stephen Whyno. The 28-year-old native of Czechoslovakia registered five points in 27 games with the Calgary Flames in 2015-16. —After being waived by the Detroit Red Wings on Saturday, Martin Frk was claimed by the Hurricanes on Sunday. The 23-year-old winger registered 27 goals and 44 points in 67 games with the American Hockey League’s Grand Rapids Griffins in 2015-16. — Justin Fontaine was released from his professional tryout (PTO) by the Dallas Stars, the team announced on Sunday.